How would you describe your work to someone that’s never seen it before? 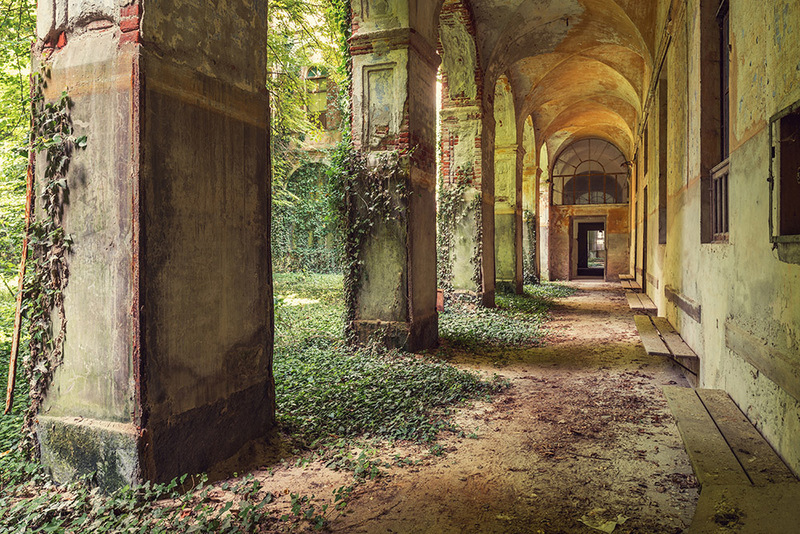 I photograph abandoned buildings across Europe. They’re all quite grand in style and I try to focus on composition, with straight lines, symmetry and leading lines. I’m also really quite obsessed with texture. If I can combine all of those elements then I’m perfectly happy. Why are you interested in decaying environments? I’m not really quite sure where the obsession came from. It was definitely more to do with the adventure side of it when I first started out. The locations themselves were so interesting with their stories and histories, and being rebellious and sneaking into them was also a big draw. However, now it’s all about the photography. How do you get into the houses? The majority of buildings have their windows and doors open because there’s not enough money to spend on securing them. I never break in, so if I can’t get into a building then I just leave it. It’s not worth the risk, so I just rely on doors and windows being open. Urban Exploration has a thriving community. Did you start off by going into the buildings with other people? I started doing it by myself because I found a local abandoned dairy farm. I didn’t really realise that it was a real thing until I started googling a bit and found a forum with lots of like-minded people. I actually found my boyfriend through that forum and I still drag him along on shoots now. It was all about the experience at the start, with the exploring and the parties, but I luckily made a career out of it. I’m so impressed that you went in by yourself to that dairy farm! I still actually go into the buildings by myself. Recently I flew to Prague and then I drove to parts of Germany alone and that was amazing – although it was probably the wrong time of year for it because it was freezing! What’s the most difficult place that you’ve shot? At the time this was incredibly difficult, although with my experience now I’d probably find it easier. It was an asylum in London and the problem was that there was 24-hour security, cameras and sensors that would set off an alarm if you walked past them. What I occasionally had to do was crawl on my hands and knees through a tunnel for a few feet and then stand up. It was a tunnel network, so I had no idea where I was, so I had to use a tunnel map. It was really quite disorientating! I finally got to the end and I had to crawl up through the floorboards to access the wards. I actually heard the security walking above me at one point and he was shouting, “hello! I know you’re down there!” and it was such a thrilling feeling. I was so scared at the time, but I look back on it now and laugh because it was just ridiculous. There was another point where we wanted to get to the east side of the asylum. But to get there we had to go through the tunnel and come up to the main hall, crawl through a window into the wards and then back down into the tunnel again. The security guards were always walking through that section, which made it such a great adventure. Did you ever have the James Bond theme playing in your head at these moments? Haha, not really! It was more just hearing my heart thumping in my ears! I wasn’t afraid of getting caught; I just didn’t want the adventure to be over. I do this full time now, but I feel like I come across less and less security, but maybe that’s because I’m choosing places where there aren’t any. I’m not doing that deliberately; I think it’s just that I’m going to locations that no one cares about. I found that especially in Italy and Germany there’s a lot less security generally. A lot of them are owned by foreign investors, who have control over the land but just don’t do anything with them. I’ve rarely come across an owner, but when I have it’s been quite a scary experience. If you do want to get into this I’d advise you to just be careful, especially in the UK. Occasionally I come across locations that are impossible to get in so I’ll seek permission, and luckily because a big chunk of my portfolio is made up of images that I’ve been commissioned to take or sought permission for, I can send them my CV and usually it’s okay. Sometimes I’d rather do that, because it makes my work a bit easier. Have you ever had any trouble where someone’s recognised a building in one of your photos as their house? I don’t want to jinx it, but that’s never happened – touch wood! If I’m shooting the kind of place where I think that could happen then I’ll seek permission first. It really depends on the location. I used to shoot a lot of houses where belongings had been left behind, but I don’t really do that anymore. It felt like I was trespassing, but in a much more significant way than, say if I was shooting a swimming pool owned by a town council. Do you ever look into why these buildings were abandoned? Sometimes I do if it adds to the story of the location, but most of the time it’s because they can’t afford to renovate it or the person that lives there dies and then there are arguments between the family members and they can’t decide what to do with it so the place gets left abandoned. However, sometimes I like my viewers to make up their own minds. Do you ever try to have a message or deeper meaning into your work? I do sometimes, but, like I said before, I mostly like my viewers to form their own opinions. But, that has started to come across my mind recently and I think I’d like to delve deeper into that. 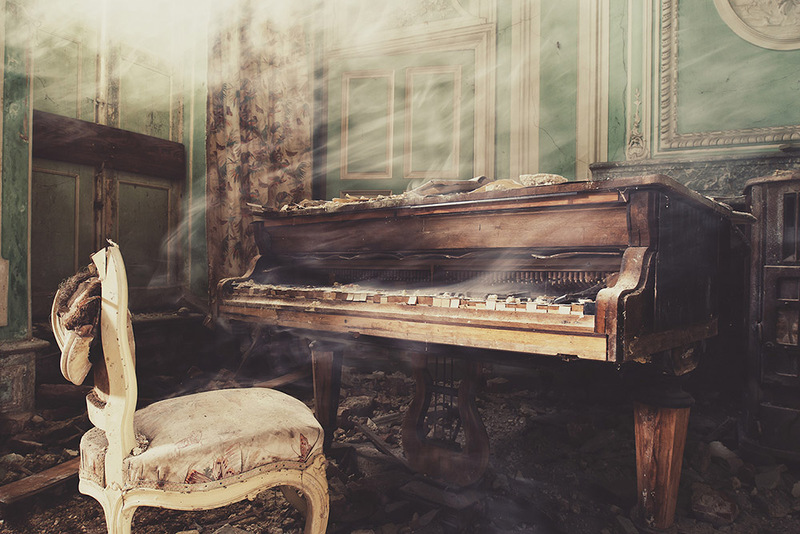 Why do we have so many abandoned buildings? Why do we have so many housing shortages? All the recent stories about refugees have really made me start to think about the fact that I’ve slept in a lot of these buildings, so I know other people can quite safely. I think we’re now just so obsessed with red tape, bureaucracy and health and safety, which really does annoy me. I’d like to think that one day my work could inspire people to start a project and help others out. I’d like to be the Leonardo de Caprio of housing shortages! What’s been your favourite place to shoot? It’s probably a castle in Belgium. It was used first as a family home and then as a boarding school. It’s my piece called ‘Blue Orphanage’. It was a gothic castle that was absolutely incredible with huge sweeping staircases, 60ft clock tower and massive gardens. Getting there was really interesting, as you had to either scramble up a big hill, or trek along a long path through enchanted woods until you arrived at a drawbridge. It felt like a fairy tale. It was such a cool place to shoot, it had so much decay and it was just amazing. But unfortunately it’s being demolished, which is so disappointing. But because it’s being demolished it almost makes me even more fond of it, because I captured that building at that specific time. I probably won’t see a building like it again because it was so unique. 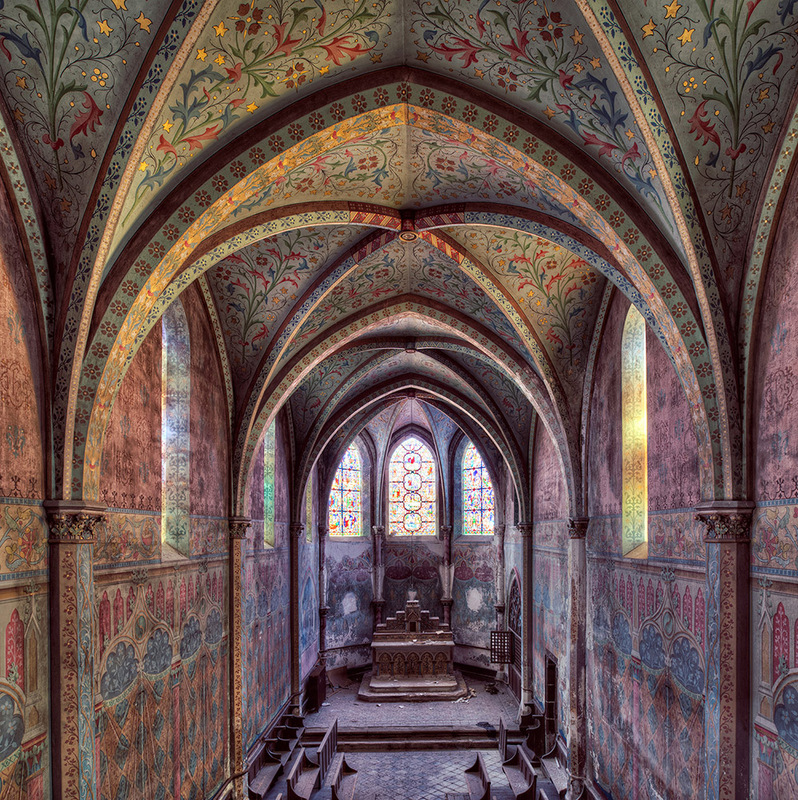 What do you think makes a good Urban Exploration shot? I think one of the most important things is composition. There should be strong lines to lead your eye into the frame, or if there isn’t, then there should be a striking object of interest in the foreground. Try and avoid using too heavy HDR, because it can be distracting and take away from the location. People are so obsessed now about technology and what equipment you’re using, when it should really be about the place. If you want to shoot old buildings like this then it’s worth looking into symmetry. The architects back then weren’t so interested in glass and concrete, it was more about interesting features on the wall. Do you have any advice for photographers that are just starting out? Generally, I’d say try not to shoot anything and everything. Try shooting a few things and see what you enjoy. I think people can start out and get overwhelmed. Try not to get too obsessed with social media likes, just enjoy what you’re doing. While the gear is important in some aspects, finding a subject that you really enjoy shooting and fine-tuning your skill is key. Look for advice from other people and don’t be disheartened by any criticism – it’s the only way you can move forward sometimes. If you want to get into urban exploration then make sure you use your common sense. If possible, try to go with someone else and don’t think you’ll get into every location because it’s not always possible. 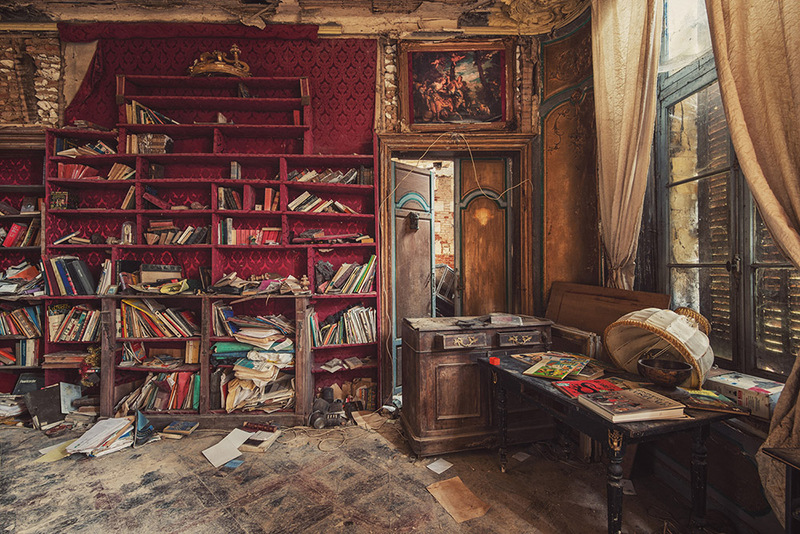 Gina Soden is a London-based fine art photographer who specialises in abandoned structures and locations throughout Europe. See more of her work here.